Xu Fugui: If Youqing does as daddy says, our lives will get better and better. Our family is like a little chicken. When it grows up, it becomes a goose and that will turn into a sheep. The sheep will turn into an ox. Xu Youqing: And after the ox? Xu Fugui: After the ox is Communism, and there will be dumplings and meat every day. 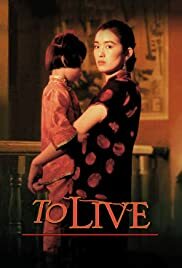 Yimou Zhang's "To Live" begins in the late 1940s and covers several decades in the life of Fugui (You Ge), his wife Jiazhen (Li Gong), and their two children. It is an excellent family drama, provoking both laughter and tears, and distinguishing itself from similar movies because of its commitment to showing how China's changing society affects the family. It takes the huge subject of "the first twenty years of Communism in China," and brings it down to a human scale. Both leading actors nicely portray the way their characters change over the years. At first, Fugui is the stereotypical "callow young man" and Jiazhen the even more stereotypical "long- suffering wife," but the screenplay and actors eventually deepen the characterizations. The best sequence of the film covers the Chinese Civil War. Wisely, Yimou Zhang resists the temptation to make the movie too epic, and instead focuses on Fugui's personal experiences. The result is a very moving depiction of the human cost of war. In another striking touch, Fugui's hobby is singing with a shadow-puppet troupe. The puppets not only provide an interesting glimpse into traditional Chinese culture, they also take on a symbolic meaning. After watching "To Live," it's easy to see why the Chinese authorities banned it: there's a lot of tragedy in the film, and in most cases, Communism is to blame. Remarkably, though, Zhang also makes many of the Communist characters sympathetic. For instance, Fugui and Jiazhen's daughter marries an officer in the Red Guards, who is a little ridiculous in his devotion to Mao Zedong, but not a villain. This is in keeping with the overall spirit of "To Live"--humanistic and subtle, instead of bombastic or propagandistic. It's both an important examination of recent Chinese history, and a universal story about how individual human beings manage "to live" in times of hardship. A rare combination, and one well worth seeing.